We encourage you to submit your favorite business links, resources and tools. Please send your links to us at cbsilver@yahoo.com. www.legalmarketing.org The Legal Marketing Association (LMA) site. www.lawyermarketing.com FindLaw’s site for legal marketing services. www.legalcommunicationsgroup.com - A law firm tv advertising agency based in Pennsylvania. www.lawbizblog.com/cat-about-ed.html Ed Poll’s law business site. www.legalmarketingblog.com Tom Kane’s legal marketing site. blog.larrybodine.com Larry Bodine’s legal marketing site. www.myshingle.com Carolyn Elefant’s site for solos and small law firms. patricklamb.typepad.com/perfectservice Patrick Lamb’s blog on legal marketing. blogs.law.harvard.edu/amy Amy Campbell’s Web Log on marketing. www.altmanweil.com Expert legal consultants to the legal community. www.whillsgroup.com Law firm business development and consulting. www.acuitylegal.com Executive coaching for attorneys. www.imslegalmarketing.com Marketing collateral for lawyers and firms. www.rwlynch.com Marketing for personal injury attorneys. www.poweradvocates.com Law firm website development and Internet marketing. www.smartmarketingnow.com Marketing, branding and advertising for lawyers. www.wingtip-online.com Marketing and advertising services for lawyers. www.legalinternetmarketing.com Legal internet marketing & website design. www.newclient.us Internet advertising for lawyers. www.bardmarketing.com Strategic marketing services in the legal profession. www.rwlynch.com Runs InjuryHelpLine group advertising. www.einsteinlaw.comMarketing and communications firm for lawyers. westallen.typepad.com Stephanie West Allen’s blog on law and marketing. www.hildebrandt.com Premier legal consulting firm. ossipsa.com/index.php Law practice management and technology blog. www.whataboutclients.com Dan Hull’s weblog on servicing business clients as valued customers in American law firms. adverselling.typepad.com Jim Hassett’s LegalBizDev blog specializes in business development coaching and workshops for large and mid-sized law firms. www.abanet.org/lpm/home.shtml ABA Law Practice Management Section. www.law.com/jsp/law/sfb/marketing.jsp Small firm marketing from The American Lawyer. www.markmaraia.com Relationship development coaching for lawyers. 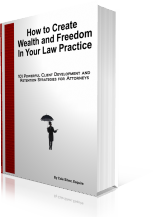 www.clientfocus.net Sara Holtz helps lawyers become successful rainmakers. www.treyryder.com Education-Based Marketing for lawyers. www.gerryriskin.com Marketing and Management Programs for law firms. goldenmarketing.typepad.com Marketing strategies for lawyers. www.arnieherz.com Lawyer practice and life resources. www.lawyer-advertising-blog.com Blog for lawyers to find agencies, consultants, vanity phone numbers, advice, tips and post questions to the experts. www.bmacewen.com/blog Strategic planning for law firms. www.lawyersintransition.com Hindi Greenberg legal career consulting. www.decisionbooks.com Offers books, workshops, and other career resources for a life in the law. Great resources included. www.janinalatack.com/lawyers.cfm Career Consulting and Executive Coaching for professionals. www.optionsforlawyers.com Career coaching for lawyers. www.careerchangeability.com Career management for professionals. law-career.blogspot.com All about careers in the law. powerfulcoaching.comPersonal development coaching for lawyers. www.abanet.org/abastore Ask the Career Counselors. . . Answers for Lawyers on Their Lives and Life's Work.